Ten years ago, if you told someone you were having your pet professionally photographed, you’d probably get a few laughs or eye rolls. But the pet photography industry has exploded over the past decade, especially in Australia, the USA, and now here in Canada. More and more dog owners are investing in photos of their four-legged family members. We have adopted two dogs, and can vouch first-hand for how awesome it is to have them as a part of our family. If you are thinking of investing in custom dog photography, here are few ways you can prepare for your session to make it a fun, relaxed, and stress-free experience. “My dog would never sit still for photos.” Solution: bring a leash. A common trick that I use when photographing pets outdoors is to keep them on a leash at all times, and then remove the leashes during the editing process. When I volunteered for a dog rescue while I was living in Nova Scotia, I photographed all kinds of dogs with various behavioural problems. I never met one that I couldn’t coax into getting the perfect photo. Bring a long, thin leash with you to the session, and you’ll be able to keep your dog safe, and help them stay in just the right spot. 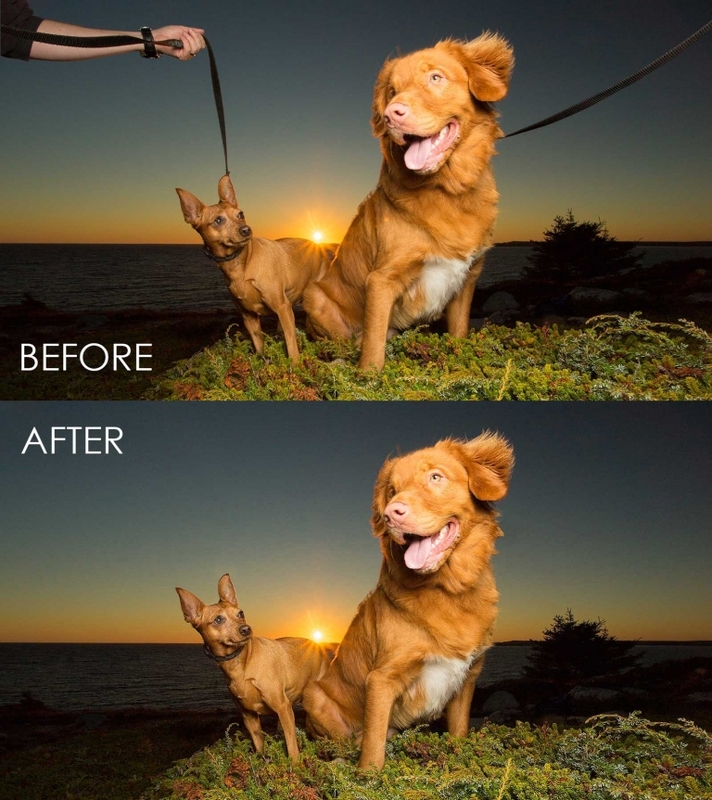 Leashes can be removed from images during editing, making it a lot easier to position your dogs during the session. Just like you’d clean yourself up before having your own photo taken, giving your dog a bath will help them to look and feel clean. If you have the type of breed that needs regular grooming, considering scheduling them to be groomed a few days to several weeks prior to your dog photography session. For large breeds like this Great Dane, giving them some exercise prior to the session will help to keep them calm and attentive. If you have a very energetic dog, it’s smart to take them for a long walk before your session. They’ll be more relaxed and attentive if they’ve just had some exercise. 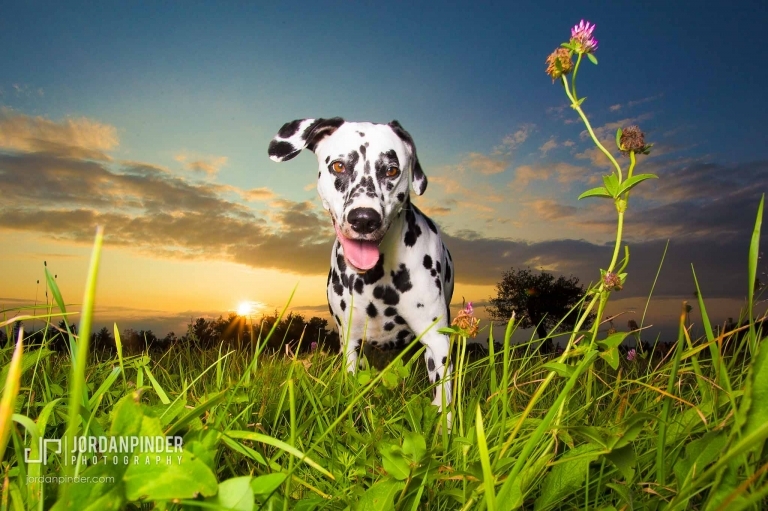 The sessions needs to be fun for your dog, in order to capture their true character. Dogs that have a bit too much energy might get irritable as we try to keep them still while taking their photo. Of course, exercising your pooch before the session generally applies to healthy dogs. Elderly dogs or those that are recovering from an injury should take it easy before a session. Many of my clients have contacted me to arrange for a dog photography session after learning of their pup’s terminal illness, and every session is tailored to accommodate the special needs of any pet. Dog photography sessions take place year round, and are usually scheduled at sunset to get the best sky possible in the background. You can find more information on my dog sessions on my website here.